This keynote was delivered today at EDEN 2015 in Barcelona. (Or at least, it's a version of my talk...) You can find my slides here. When I was asked to give a title for this talk several months ago, I quickly made something up (as one does), throwing out this phrase “Learning Networks, Not Teaching Machines.” I figured I’d say something about the century-old efforts to automate education and the possibilities instead for a new and different technological architecture that might help us re-orient education towards learners certainly, but also towards greater equity and social justice. But as often happens with me, the more I thought about the topic, and the more I explored the history and the ideology of “networks,” the less confident I became that we’re paying close enough attention to justice, to politics and power when we use that word “network” as either a noun or a verb or an adjective. And I don’t mean this just when we use the word as a metaphor for personal and professional connections either. 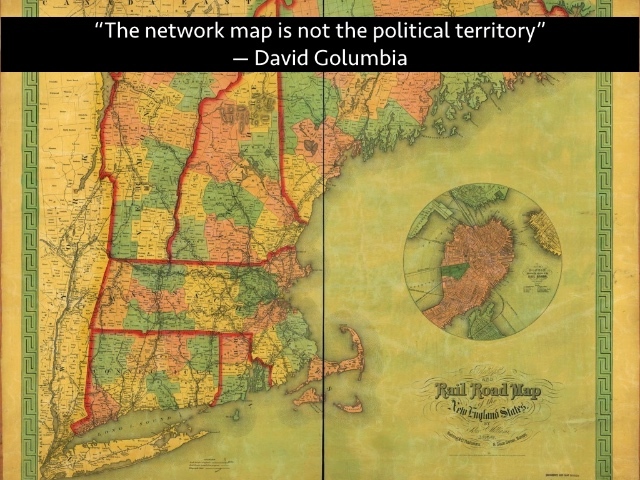 “The network map is not the political territory,” as VCU professor David Golumbia tweeted, just a couple of days after I submitted the title for this talk. As some of you might know, I’ve been working on a book for a while now called Teaching Machines that explores the history of education technology in the twentieth century. In part, the project grows out of my frustration with the claims made by the latest batch of Silicon Valley ed-tech entrepreneurs and their investors that ed-tech is “new” and that education – I’m quoting from The New York Times here – “is one of the last industries to be touched by Internet technology.” This is a powerful and purposeful re-telling and revising of history, I’d contend, designed to shape the direction of the future. In fact, education was one of the “industries” – I loathe that word, that framing too – that helped create Internet technology in the first place. Education – or more accurately, I suppose scientific and technical research at universities – was one of the first industries to be “networked” by the Internet. Of course, these sorts of revisionist narratives shouldn’t really surprise us. We always tell stories of our past in order to situate ourselves in the present and guide ourselves into the future. But that means these stories about education and education technology – past, present, future – really matter. 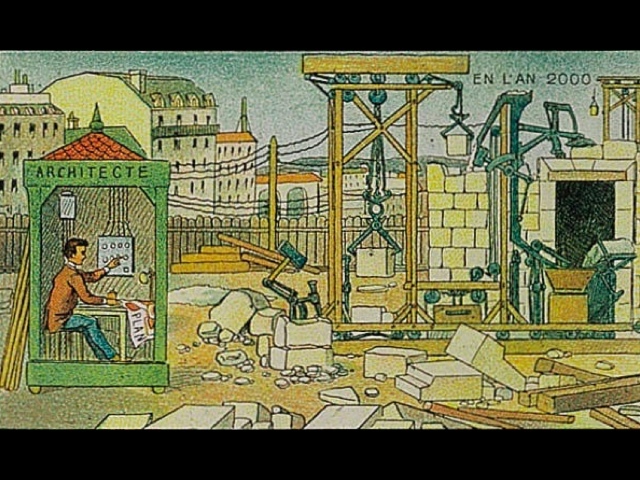 This image represents to me ed-tech’s past, its present, and its future – hilariously sad since it’s over one hundred years old. 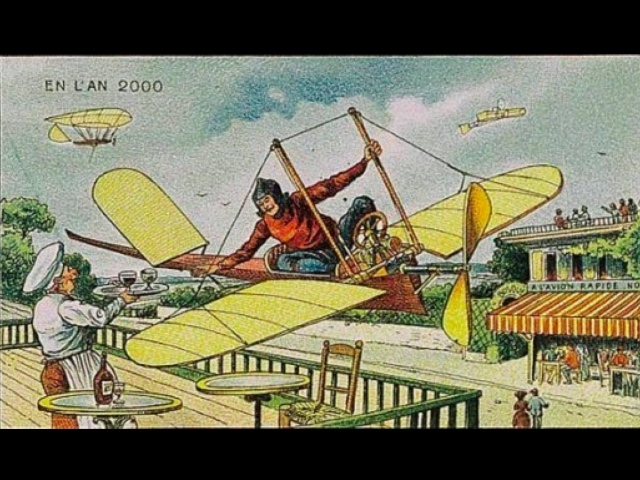 This print from 1910 is by the French artist Villemard, commissioned as part of a series “En l’an 2000” (“In the Year 2000”) to promote the World’s Fair and to celebrate the new century (and centuries to come). 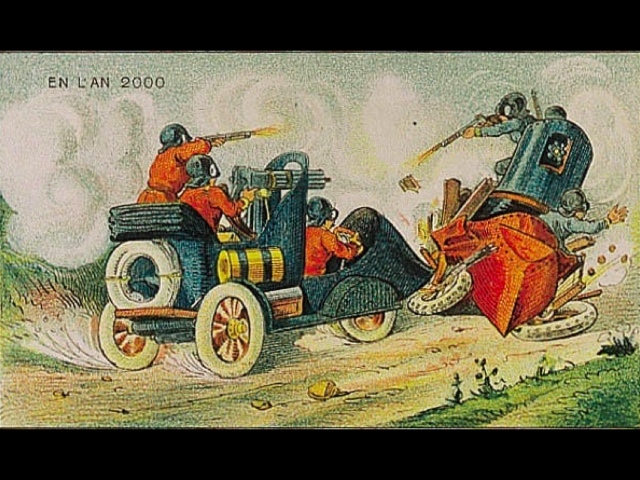 Prints like this one were included in the packaging of cigar and cigarette boxes and later became popular postcards and PowerPoint slides. 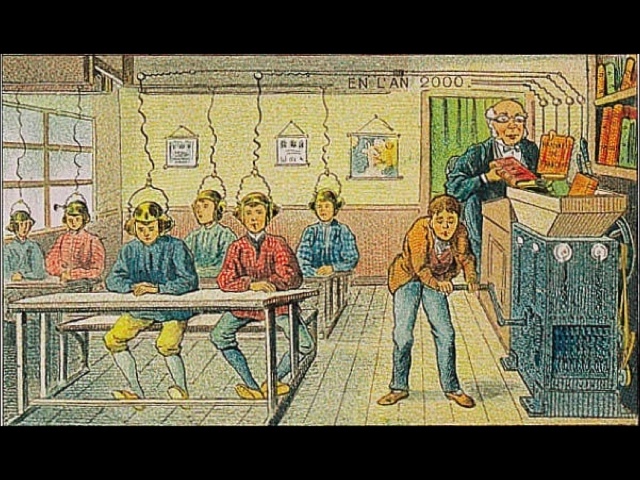 Here we see the teacher stuffing textbooks – L’Histoire de France – into a machine, where the knowledge is ground up and delivered electronically, via wires connected to headphones and helmets, into the brains of young male students. Arguably this image is so frequently cited because it confirms some of our beliefs and suspicions about the future of education: that it’s destined to become mechanized, and that automation is designed around a belief that educational content is something to be delivered. Students’ heads are something to be filled with knowledge. There is too, I’d contend, a certain “vestigiality” of education technology. With each subsequent technological invention or innovation, that is, as ed-tech purportedly “evolves,” it continues to carry forward older features and structures regardless of their continuing functionality. I think we can see this in the Villemard print; it also explains why it still resonates so deeply with us. We don’t simply recognize the classroom; we recognize the impetus behind a century-old prediction about the future of education technology. Just three years after this print was released – that is, in 1913 – Thomas Edison famously predicted that “Books will soon be obsolete in schools.” Not because books were to be ground up by a knowledge mill. Rather, Edison believed that one of the technological inventions he was involved with and invested in – the motion picture – would displace both textbooks and teachers alike. “I believe that the motion picture is destined to revolutionize our educational system and that in a few years it will supplant largely, if not entirely, the use of textbooks,” Edison asserted in 1922, a reminder too that predictions about the coming ed-tech revolution are at least a hundred years old. We don’t talk as often about the wires that connect the textbook grinder to the students’ headphones. 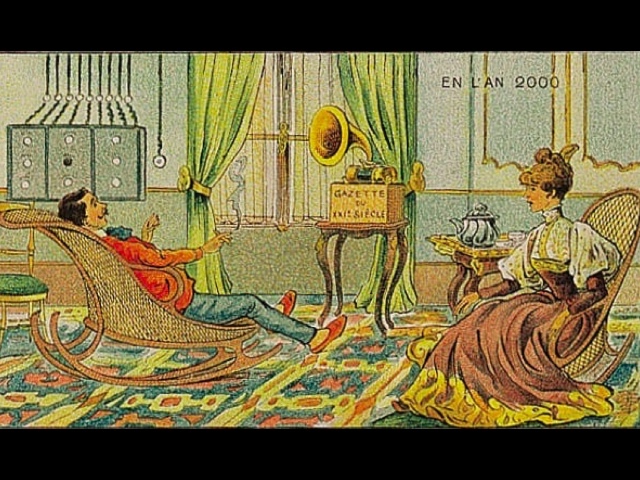 These students, arguably, are networked (something that Edison’s film projector did not offer, I should point out – although we can see in this “En l’an 2000” print, that there was already an imagined world where moving images and sounds would be sent over the network). But what can we say about the Villemard vision of “a learning network”? Does it meet our standards today, our belief in the ways in which networks can transform teaching and learning? I’d imagine it does not because this particular learning network is centralized. In that way, it is more akin to Edison’s vision of the future of education – where the knowledge is delivered by (and this power resides in) whatever replaces the teacher and the textbook. For both Edison and Villemard here, the students are receptors, not transmitters of knowledge. When we talk about the potential for “networked learning” today, I think (I hope) we mean something different. The promise: the Internet – and the Web in particular – enable a readable and a writable platform, where a multitude of voices can express themselves as creators not just consumers and not just through text but through a multitude of media – audio, video, still images, code. These new wires have powerful implications for self-organized learning, some argue – a new participatory culture of learning that need not be managed or monitored by formal educational institutions or by traditional sources of information. The new networks, like the Web itself, ostensibly act as this very postmodern sort of technical infrastructure whereby power is decentralized, distributed. But it’s not decentralized entirely. It’s certainly not distributed evenly. It never has been. Yet there’s that tendency once again to recast the history of technology as equitable if not equalizing – a nostalgia for a “web we lost” – such as when last year Sir Tim Berners-Lee said it was time to “re-decentralize” his invention, the World Wide Web. Berners-Lee noted – rightly so, I’d say – that “for-profit internet monopolies such as search engines and social networks,” along with government surveillance, threaten the Web’s original, open infrastructure. I’ve been thinking about this faith we’ve put in online networks – this trust that they are open, for example, or that they flatten hierarchies. I’ve been thinking too, as I’ve researched the history of education technology and teaching machines, about other, older networks. Indeed, many of these networks have not gone away. The telephone company or the television cable company is likely now – in the United States at least – your Internet provider as well. We are building our learning networks on these older technologies. We are building them on and with pre-existing and emerging monopolies. Take Comcast, for example, the largest cable company and home Internet service provider in the US. It is the country’s third largest home telephone service provider. Comcast also owns one of the original “big three” networks NBC, along with the Spanish-language network Telemundo. It owns the film production studio Universal Pictures, as well as the studio’s associated parks and resorts. It has tried unsuccessfully to buy its competitor, cable provider Time Warner Cable. It has tried unsuccessfully to buy Disney (which in turns owns ABC). Comcast also partnered with the online learning site Khan Academy a few years ago, incidentally, making a substantial donation to the education non-profit and paying for TV advertisements for Khan Academy which would in turn promote Comcast’s Internet Essentials program, a federally-mandated initiative in the US whereby Comcast offers low-income families broadband for $9.95 per month. This cheaper broadband has been criticized for a number of reasons, in part because it offers download speeds of only “up to” 5 Mbps, sufficient for streaming online video content but barely. Comcast Internet Essentials does not include a WiFi-enabled modem. When we think about Comcast’s lobbying and legal efforts, its opposition to “net neutrality,” for example – the principle that Internet Service Providers treat all data on the network equally – we can start to see how important it is that we pay attention to “the wires” and to the network. The physical infrastructure; not the metaphor. As I’ve conducted some of my recent research about the history of education technology, I’ve become fascinated by a different sort of pre-Internet network – the television network. 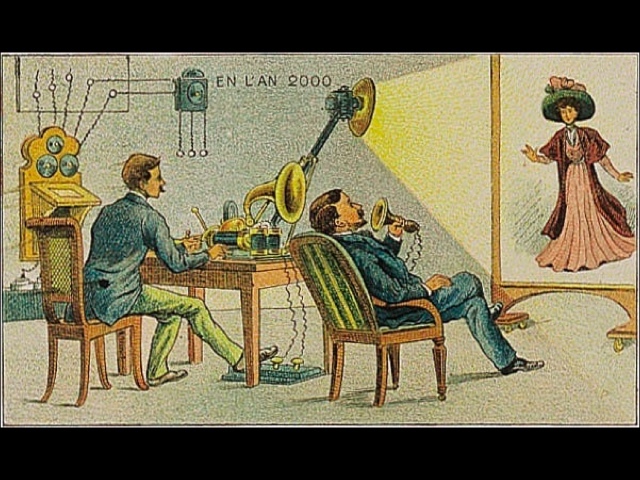 Television technology was developed around the same time as film which did not – sorry Edison – replace textbooks, but did shape our ideas about scale and broadcast – for our purposes here, specifically the broadcast and delivery of educational content. The FCC (the Federal Communications Commission) was/is in charge of determining the engineering standards for television and approving licenses, with the first commercial licenses issued to NBC and CBS-owned stations in New York City in 1941. (NBC and CBS were already powerful radio networks – remember, we build new networks on top of older ones.) As the demand for licenses (and more broadly the demand for television) grew, many educators felt as though they were going to need special channels devoted specifically to education if they were going to be able to compete with the commercial broadcasters. In 1952, the FCC announced that it would reserve 242 television channels for educational use. Educational TV stations immediately faced several challenges: PR and programming to name just two. Often the stations did not have much regular programming to offer, and as such they tended to be off the air on the weekends. What programming they were able to provide was frequently low-budget and dependent on local producers. There was no educational network; that is to say, there were just individual stations, often with a very limited transmission reach. Indeed, one technical issue all early television stations faced was actually getting the signal from the transmitter to receivers, whether in homes or in classrooms. In the 1940s, Westinghouse engineer Charles Noble had developed a solution to this problem – something he called “Stratovision.” Stratovision involved broadcasting the transmission from the air, rather than the ground, via aircraft flying at 25,000 feet. But commercial television didn’t pursue Stratovision, instead developing networks that shared and broadcast programming via affiliate stations simultaneously across the country. Commercial TV chose networks. And that – namely, networks and affiliates – was something that educational television did not have. Westinghouse contacted the Ford Foundation, which was funding many early educational TV initiatives, and suggested that Stratovision be used to this end; and the Ford Foundation in turn helped support one of the more unique experiments in US ed-tech history, the Midwest Program on Airborne Television Instruction (MPATI). The program, which ran out of Purdue University from 1961 to 1968, involved two DC–6 airplanes with over six tons of transmitting equipment and shelves containing a library of backup videotapes circled the skies, broadcasting educational TV to membership schools below – in Indiana, Illinois, Kentucky, Michigan, Ohio, and Wisconsin. It’s hard to call it a success – it struggled with a number of financial and technical and scheduling problems. And as historian Larry Cuban notes, teachers simply didn’t use television in the classroom all that much. But that didn’t stop the push for more instructional television or the belief that this new technology would, to quote Edison again, “supplant the use of textbooks.” But again – let’s take a closer look not at the television itself but at the control of programming, channels, spectrum, networks. I recently wrote a story about the history of “The Learning Channel,” which is back in the news once again because of the behavior of some of its reality TV stars. (And once again I apologize for this being such a US-centric talk, but even more deeply, I apologize for US reality television.) The Learning Channel, now known as TLC, actually started as an education initiative to bring satellite television – televised continuing education for teachers, specifically – to remote areas in Appalachia, a historically poor, rural area in the mid- to southeastern US. The Appalachian Education Satellite Project was launched in 1974, taking advantage of NASA’s ATS–6 satellite which agreed to transmit educational broadcasting for free. Two years later, NASA announced that the satellite was experiencing technical difficulties, and so the project bought transponder time on a commercial satellite. This started a chain of events that, I think, should be quite familiar to those of us in education. The satellite transmissions were no longer free, so the Appalachian Education Satellite Project, a non-profit organization, had to come up with more revenue. It decided to formally create a television network so that it could expand coverage and programming. The Appalachian Community Service Network launched in 1980, branding itself “The Learning Channel.” At its peak, some 70 universities granted academic credit for its courses. See, I’m particularly struck by these stories when I stop and consider “learning networks.” Many television networks grew out of earlier radio networks, and as I mentioned earlier, these are now massive multinational media corporations. We must ask: Who owns the “pipes” and “the wire”? Who owns the means by which content is transmitted? Who owns the satellites? Who owns the spectrum? Who owns the cables? Who owns the network? What networks – what infrastructure – have we inherited? I realize, of course, that when we invoke “learning networks” today, we aren’t (necessarily?) attempting to emulate the Discovery Channel or NBC or the BBC. And yet I think it would be naive to think that the work we do online – our ability to be “connected” through the Internet – is not something built upon or at least adjacent to these powerful networks. We might not talk about them. But that doesn’t mean they do not shape what we can do online, who has access, what that access look like. They shape too, as early educational television channels learned, what the content looks like and what the commercial competition looks like when it comes to garnering attention. The Internet and the Web do not exist at the end of history. Technology will change. But the geopolitics, the economic forces will change the Internet and the Web as well. 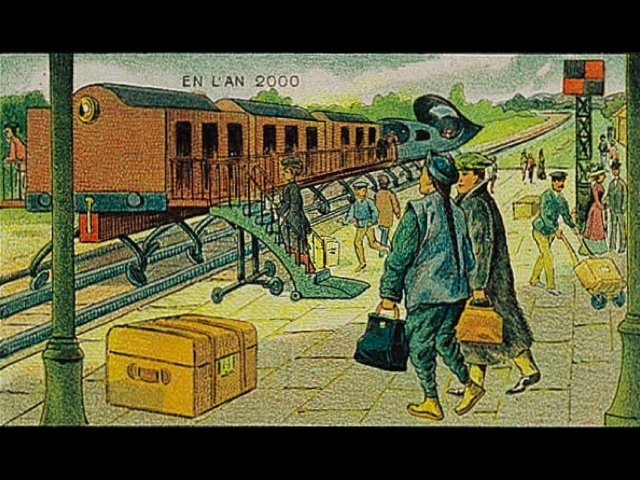 Networks change – canals are replaced by railroads; radio stations are replaced by television and now the Internet. The Internet will be likely replaced by something else. And no doubt, we can see already its consolidation and centralization. We can see the battles for who owns the signal. (The FCC plans soon to license off more wireless spectrum for the “Internet of Things” via auction – that is, to the highest bidder.) We can see the battles for who owns, who controls the network. Education has not historically fared well when it comes to competing with commercial providers – not on the radio, not on the television, nor I’d argue on new computer-based technologies. These networks have triumphed commercially, politically. In turn, they frame what we mean by network – what we expect them to do, who gets to participate in them and how. There is no inevitability here. And resistance and alternatives are certainly possible. But we must act to shape the future – to shape the technology and the politics that we want to have. We must act to shape the learning networks we want to have – starting, as I originally intended this talk to address – that we do not want the centralized control, the automation, the teaching machines that Villemard envisioned for us a century ago. If, as some argue, learning networks are powerful new ways for us to organize and share as learners, then we must consider how we can build and wield them (or at least, how they are built and wielded). Networks – not just as analogies, but as what is becoming the very real architecture of how we learn and live. 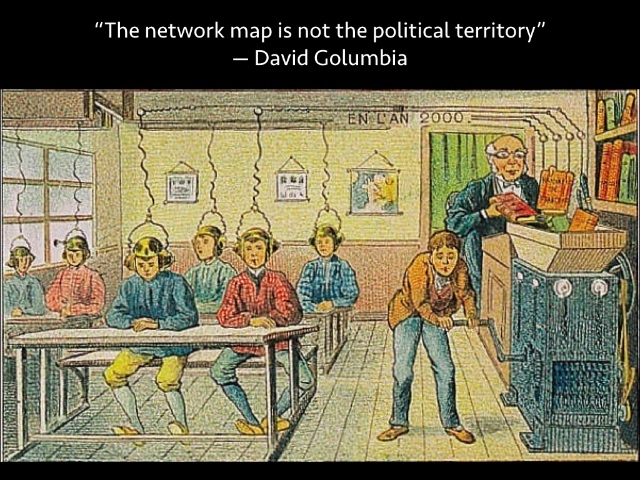 “The network map is not the political territory.” What territory do we maintain for the future of education? Whose network map are we using to find our way?